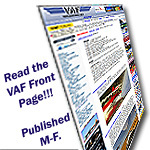 Way, way back in 2007 we ( the VAF) were offered one the the first batch of group buys by Jeremy Summers of MilSpec. He offered a complete set of his newest 1/4 turn SS fasteners for our RV's at a very fair reduced price. Now speed ahead to November 2017 as I had my kit laid out and ready to install on my slow, slow, slow build RV6-A. A visitor to my hangar mentioned he thought he heard that the MilSpec fasteners were recalled or AD'd or something but wasn't sure what it was. Just to be sure, I dropped a line to MilSpec sending photos of what I had to check there status before I started. Jeremy answered and assured me the fasteners were not recalled and were fine. But then he told me that a better design had been adopted. To my amazement he offered to replace mine which were still in there sealed bags with the newer more robust fasteners. Just that part is fantastic but then he offered to make the exchange absolutely free of charge. Try exchanging anything after 10 years with any other company. Unbelievable! I wonder if GRT would exchange my 8 year old EFIS since I haven't used it yet? NOT! Just think about MilSpec when considering you fastener needs. They stand by their products better than anyone. Googling "MilSpec" isn't very helpful. Can you be a little more specific? try this link. I have a set on my 9A and love them! I believe the new design is at least 5 years old. You can tell if it's the old design if there are four distinct bent aluminum tabs holding the receiving socket in place on the back side. The newer design eliminated this . You probably have the current model. I have used them on the last 3 Rv-10's fitted with removable lower scoops and I like them a lot. I use the floating and adjustable receptacles and because of the different thicknesses of the lower cowl, installing them to the right height was a snap! I have emailed them many times with my custom questions and they were very helpful with getting the right fittings for the project at hand. One of the best feature of the MilSpec fasteners besides being well made is the ability to be adjusted to the exact thickness of the joining parts. . Fiberglass work is hard enough without having to maintain exact thickness while building up and preparing mating surfaces.